It must be hard to make a good monster move, especially nowadays. There are audiences who want to see big, nasty beasts wrestle each other as they destroy major cities going “fe-fi-fo-fum” and whatnot. But ever since the likes of “The Dark Knight”, “The Avengers,” and “Inception,” some people want a little more substance in their blockbuster summer movies (at least until Michael Bay storms cinemas again this summer…twice). So there has to be a functioning story, interesting characters, and eye-popping visuals in order to bring in a crowd. With all of that said, is there still a place in American cinema for the King of Monsters? Godzilla, one of Japan’s biggest and most influential exports, is back at the multiplex for the first time in a decade and the first time in American cinemas since 2000, and he’s been rebooted for the 21st century in a big way thanks to multi-million dollar effects and a top-notch cast including Bryan Cranston, Aaron-Taylor Johnson, Elizabeth Olsen, and Ken Watanabe. Cranston is a former nuclear power plant supervisor in Japan who lost his wife after the plant they worked at melted down due to an unforeseen anomaly. He’s been trying to figure out why the government has been covering up the incident ever since while his son (Taylor-Johnson) is a bomb diffuser for the Army and has a family (with Olsen) of his own. But when the two sneak into the now quarantined plant, they discover something monstrous that could destroy mankind. According to the scientist funding the operation (Watanabe), they learn the entire nuclear bomb tests and developments during the 40s and 50s were attempts to kill this monster (called a Massive Unidentified Terrestrial Organism, or MUTO). Fortunately, the scientists believe there is another monster (the big spiked G himself) on the hunt for the MUTO and that they must clear out the cities so the monsters can duke it out. Now warning must be given that the fight scenes in “Godzilla” are very sparse in the 123 minute running time. 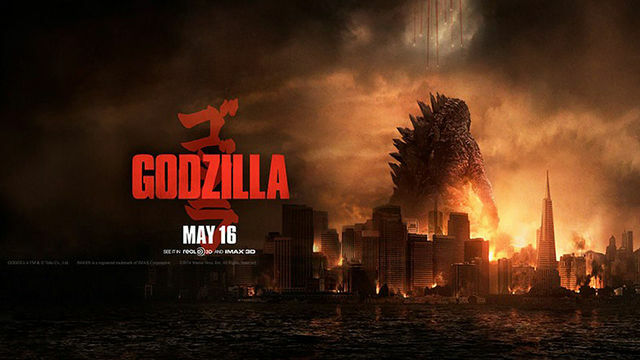 Fights are either shown in rapid cuts between scenes of dialogue or barely shown on newscasts, which may anger the viewers that came to see Godzilla rumble with monsters and nothing else. It’s understandable why director Gareth Edwards put this in, which is to build up to a pretty awesome finale. If viewers have enough patience, they might be pretty satisfied at the spectacular final fight Godzilla has in San Francisco. Godzilla himself is an impressive sight too, with his epic roar fully intact and updated for 2014. Edwards gives great set-ups and entrances for his monsters, but he needed to work on execution. He also needed to give his actors proper motivations. Cranston, fresh off of TV’s “Breaking Bad,” is an emotional powder keg with his voice going from a shaky quiver to a hoarse yell. Taylor-Johnson seems a bit lost in this movie, like he’s unsure how to react. His face keeps a stern grimace throughout the movie, which isn’t something audiences to connect to (but the audiences would probably rather connect with Godzilla instead). Watanabe always looks either confused or nauseous any time he’s onscreen, so he may have had the stomach flu during shooting. If it seems odd that I haven’t mention Ms. Olsen yet, it’s because she’s barely in the movie and of no importance at all. Thankfully, “Godzilla” is not trying to be a funny crowd-pleaser that Roland Emmerich’s 1998 film tried (and failed miserably) to be. This is strictly a monster movie that goes for quiet build-up instead of fight scene overkill. While that attempt is admirable, there is too much character development on the wrong characters. The character that needs the most attention is, or course, the titular monster, and he is not given a proper amount of screen time. Last summer’s “Pacific Rim,” was a great monster movie because it had a near perfect balance of big brawls and dialogue. Here, there is too much focus given on characters the audience doesn’t need to care about. Since the film is about the monsters and what they’re going to do, why should there be focus on the humans who have nearly nothing to do with it? It’s like if the alien army Loki commanded in “The Avengers” were the focus of the movie; nobody cares! It’s great to see Godzilla crash into theatres again and he gets a grand finale worthy of applause. But, like Tony Stark told Bruce Banner, “Godzilla” mostly tiptoes when it needed to strut. This entry was posted in Uncategorized and tagged Godzilla, movie review. Bookmark the permalink.